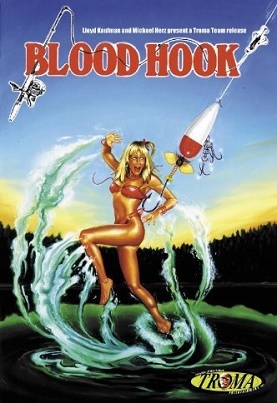 Blood Hook is not up to, or down to, depending on your perspective, Troma standards. An Illinois family fishing in the north woods, along with some randy teens in “muskie heaven,” are fishing in the backwoods. But people are being mysteriously killed by a giant hook. There’s an expert caster, Denny, who shows people how to fish, landing his lure smack dab in the middle of a life preserver ring. There’s a wacky electronics expert Vietnam vet with an assault rifle, who watches trivia shows and laments at all the idiots down south. By the call of the loon, victims are progressively killed off and there’s a music pedant who explains the devil’s tri-tones and the intricacies of musical fourths and Bach. The unspectacular (and varying in size) fishing lure finally makes an appearance an hour in, snagging a bathing cap-wearing bikini beauty. Nothing to see here. Definitely one that got away from Lloyd Kaufman. Ted Hughes, the Poet Laureate of New England, said this about fishing: “it short-circuits the need to write.” There’s an excuse for making this review so short. This entry was posted in Horror and tagged 80s horror movies by Really Awful Movies. Bookmark the permalink. Never heard of this one… I’ve never been a huge Troma fan, aside from a few staples. Am I crazy, or did the rating change from 1 1/2 to 2? You are correct. This is an undeniably bad movie, but it has its charms. Actually watched it twice for some reason. This one was tough to get through. It was picked up in the heyday when anything sold on video. I like the score and that’s about it. Got the triple feature dvd with BLADES and ZOMBIE ISLAND MASSACRE.